For, seemingly, one last ride, the gang revived it original and successful production of THE BALLAD OF JESSE JAMES. Joe took over his original role of director, with David and Larry in their signature roles. The plan was for a three week April run in St. Louis, (at Technisonic Studios), followed by one more June show at the James Farm in Kearney. The St. Louis run was very successful (see reviews), with audience response echoing the critics. David Wassilak, tall and lean, stands center stage wearing a loose duster, a big, old-fashioned hat that shades his sharp profile and a six-shooter at his hip. Then he lets out a rebel yell, and you know what? The spare set - a few plain, wooden pieces against a white paper backdrop - seems to come alive. It's like an image from a dream, clear and recognizable despite its dearth of detail. That tall, lean man can be no one but the outlaw Jesse James. Did Joe Hanrahan write "The Ballad of Jesse James" as a present to Wassilak? They're good friends - they founded the Midnight Company together - so it seems possible. Anyhow, no matter what Hanrahan had in mind, he gave Wassilak the role of a lifetime: a legendary, complex character who seems to be a lot of fun to play. Spare in performance style as well as build, Wassilak portrays Jesse as a loaded fuse, ready to ignite. But "Ballad" isn't a one-man show. His taut performance demands a little slack to allow for shifts in mood. That comes from Hanrahan, who both directs and plays Jesse's brother Frank James, and from Larry Dell as outlaw Cole Younger. Dell also plays guitar and sings. His rendition of "I Am a Good Old Rebel" - a post-Civil War tune known by several titles - establishes the mood for the whole production. Dell gives an especially clear, hard delivery to the final verse: "I don't want no pardon/For who I was and am/And I won't be reconstructed/And I do not give a damn." During the Civil War, the James and Younger brothers were Confederate irregulars. If they became outlaws after the war, it was at least partly because they considered themselves literally outside of the law - the United States government. "Ballad" explores the deep contradictions in their outlaw life. Some people saw them as romantic heroes, like Robin Hood; the government considered them thieves and killers. Even today, when nobody is likely to make a case for the Confederacy, these robbers of trains and banks retain a certain charisma. The play falters under the weight of information. Long accounts of the James brothers' history can't engage the audience like the depiction of a sad, decisive moment that the men recall differently, or a gripping, onstage performance of a train robbery. (Guess who plays the passengers?) There's never a test at the end of an evening of theater, but "Ballad" sometimes plays as though there might be. Its No. 2-pencil moments are its weakest. Through it all, however, Hanrahan maintains a shrewd distance from the central actions of the drama. He defies his audience to judge these men - terrorists? common criminals? folk heroes? - by their behavior alone. But if we can grasp why the James brothers did what they did, must we forgive them? And if so, who else might we need to forgive? Or maybe we shouldn't forgive anybody: Crime is crime. To his credit, Hanrahan manages to raise hard questions without forcing himself, or members of the audience, to come up with easy answers. Combine his intriguingly equivocal stance with Wassilak's compelling performance and Dell's music, and it adds up to a provocative piece of theater. Part Robin Hood, part terrorist and entirely a product of his times — Jesse James receives a respectful tribute from the Midnight Company in a revival of The Ballad of Jesse James. Written and directed by Joe Hanrahan and originally staged in 1999, this version of the 90-minute production plays in a vast white photography studio. While appropriate to the presentational style of the show, the backdrop eerily displaces the actors from any specific time or location. The show's style brings back memories of the recently departed Historyonics Theatre, which staged similar history lessons combined with music — the difference here is that Hanrahan has created dialogue between the characters that, while true to the spirit of their history, may not have actually happened. Hanrahan frames the production with a meeting of the elderly Frank James and Cole Younger, whose discussion of the terrible turn of events at a bank holdup in Minnesota leads into a review of their earlier days. Following attacks on their families by abolitionists and Union soldiers, the Jameses and Youngers joined the guerrilla forces of Quantrille, swearing an oath of "no mercy" and creating their own version of justice in Missouri during the Civil War. When the war's end left them destitute, Jesse forged creative solutions: relieving banks of "carpetbagger" money and hurting the "iron horse" that was slicing across Missouri. Hanrahan wisely makes the characters interesting but not entirely sympathetic — he doesn't shy from their killing ways, but the historical context softens the impact of the murders. The overtly theatrical presentation — interspersed narration, songs, short scenes and monologues — performs a similar function. Unfortunately the litany of dates slows the action and seems too overtly pedagogical — does it matter that much whether a particular robbery took place in June 1878 or March 1879? When not overwhelmed with a recitation of historical facts, the actors create intriguing characters. Hanrahan imbues Frank with stubborn loyalty and a world-weary fatigue. David Wassilak's blood-curdling "rebel yell" and sharp features create a Jesse James worthy of legend but quite human. His monologue about Union soldiers attacking his family's farm is a quiet triumph of brooding anger. Larry Dell excels in many parts — as the older Cole Younger, bitter and broken from years in prison; as the past-tense Cole; as a newspaper editor who cast the James brothers as heroes. He also adds excellent musical commentary, playing guitar and singing unrepentant Rebel songs with gritty boldness. The central conflict in The Ballad of Jesse James is an episode in which the James brothers abandon the wounded Younger brothers, who are eventually captured and sent to jail. Hanrahan presents the action Rashomon-like, providing three variations and allowing the "truth" to hover somewhere between. This artful concept would be more successful if the differences between the three scenes were more significant. A fascinating convergence of theater, history and reality will take place in June, when The Ballad of Jesse James is performed at the James Farm in Kearney at the Friends of the James Farm Annual Reunion, Black-Powder Shoot and Writer's Conference. The Bible-quoting Jesse, the Shakespeare-quoting Frank and the stoic Cole will bring a bloody chapter of Missouri history to life on the porch of the James family home. It's hard to imagine a better way to merge past and present. The Ballad of Jesse James begins with Frank James, Jesse's brother, and Cole Younger, Frank's best friend from the old gang, as old men. They're closing out their attempt to cash in on their notoriety with a Wild West show. Cole wants to reminisce, especially about the disastrous Northfield, Minnesota, bank robbery and its aftermath. If this ballad has a chorus, it's that Northfield job. We're given three versions of the scene in the woods when the decimated gang is hiding out from the multiple posses pursuing them, and Cole's two brothers are badly injured. Each version of this scene varies slightly, and Jesse looks worse in each successive version. The ambiguity about that scene in the woods makes a fitting anchor for The Ballad of Jesse James. Multiple versions of the exploits of Jesse and the gang floated around for years, especially when the dime novels of the day got hold of the stories. But with that scene as a central metaphor and with the recollections of the two old outlaws as a frame for the telling of the tale, Joe Hanrahan, who wrote and directed the piece and who plays Frank James, has done a splendid job of organizing this material into ninety absorbing minutes on the stage. Hanrahan carefully sets Jesse in his time. He was a teenager growing up on a farm in Western Missouri in the days of Bloody Kansas and the Missouri-Kansas border warfare that preceded the Civil War. Jesse's family had strong Southern sympathies. He soon joined older brother Frank in the irregulars, or guerrillas – or insurgents you could even call them. For the atrocities and retaliations of that time, of which the James family were victims, sound all too much like Iraq today. These men were marginalized after the war. When they turned to robbing banks and trains, they justified it both as the only way they could support their families and as a continuation of the Confederacy's Lost Cause by other means. Yet whatever the justification, there is an amoral streak in Jesse's eager way with a gun. That's captured both in the text and in the steely glint in David Wassilak's eye. His Jesse is a badly damaged soul, yet also a natural leader, a man with an indomitable spirit and an original mind. It's a fine portrait. The virtuoso acting in the company comes from Larry Dell as, variously, the old and the younger Cole Younger, as a Kansas City newspaper editor who helped create the legend of Jesse James, and as a guitar-strumming narrator, interspersing the tale with period songs. Dell's work is precise and fine. Compared to his colleagues, Hanrahan seems slightly detached from Frank James. Or perhaps it's Frank who's a little detached. And Hanrahan was also occupied with writing and directing. This show works well on the soundstage at Technisonic Studios, where it runs through April 9 . It's a space where Doug Hastings lights bring these men out of the past, in Betsy Krausnick's mythic period costumes. Yes, The Ballad of Jesse James does have more narration than I like in a play. But in this case, that seems almost right. And on stage, Joe Hanrahan's Midnight Productions is responsible for the first-rate "Ballad of Jesse James," slightly revised from a production a few years ago and startlingly effective on a minimal set on a sound stage in Technisonic Studio's Midtown space. David Wassilak, tall and lean and so angry one can feel it like a toothache, is James, the Missoouri farm boy who rode with Quantrill during the Civil War and went from guerilla warrior to psychotic criminal afterward. Everything James and his gang did, according to author Hanrahan and actor Wassilak, was a result of a passionate desire for revenge against the invading and victorious North, and there are moments when one can equate James' anger with that of Iraqis focussed at the American invaders and conquerors. The drama follows the James gang from its highly publicized, almost-romantic feats of bank and train robberies, to its eventual end in the swamps and woods after the failure of a robbery attempt in Northfield, Minnesota. That event, by the way, was shown beautifully in a superb 1972 film, "The Great Northfield Minnesota Bank Raid," with Robert Duvall as James. James remained an outlaw, with an occasional bank job, until he was shot and killed in his Missouri parlor by Robert Ford, described in the famous song as "that dirty little coward who shot Mr. Howard," the alias that James was using. Hanrahan portrays Frank James, Jesse's brother, and Larry Dell, as a narrator, singer and Cole Younger. All three are excellent, and Hanrahan's writing and direction wrap all the loose ends. Fine theater, "The Ballad of Jesse James," through April 9. Hanrahan’s Frank has a bit more humor than his little brother—a little less pride and maybe a touch more loyalty—although the play leaves that open to interpretation. 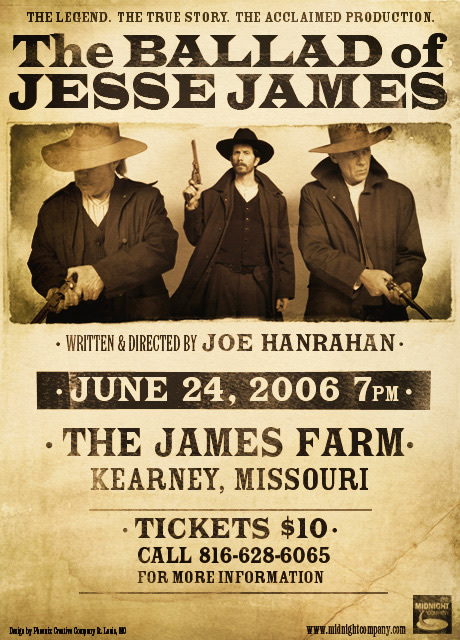 In a stark white room at Technisonic Studios, Missouri legend Jesse James (played by David Wassilak) comes to life again in St. Louis in 2006, along with his brother, Frank (Joe Hanrahan), and their friend, Cole Younger (Larry Dell). By alternating dramatic scenes with narration, The Ballad of Jesse James leads the audience through the lives of Jesse, Frank, Cole, and their families and friends, at the turbulent time surrounding the Civil War. The story of these lives that included not only robberies and murder, but also love, loyalty, and pride, is mostly narrated by everyone except Jesse himself. The extremely minimal set consisted of only wood chairs, stools, and a few props. Yet the three-man cast managed to bring a variety of settings to life, turning the white backdrop of the studio into a blank slate against which audience members could cast their own version of rural Missouri, the woods of Minnesota, train and bank robberies, and every other place visited by the narrative. Thanks to excellent performances by all three performers, it was possible to imagine everything that wasn’t there. Wassilak’s Jesse is bold, nervy, serious, and a little proud; the perfect combination for an outlaw who thoroughly believed in what he did, and who quoted Bible verses while taking Yankee money when the banks refused to give loans to Rebel supporters of the defeated Confederates. Hanrahan’s Frank has a bit more humor than his little brother—a little less pride and maybe a touch more loyalty—although the play leaves that open to interpretation, with alternate endings to the defining robbery in the outlaws’ careers, the Northfield bank robbery in Minnesota. Frank countered Jesse’s scripture with quotations from Shakespeare; the chosen texts of the brothers highlighted the differences in their personalities. Dell went through amazing transformations onstage, portraying Cole at the time of the James gang’s reign, as well as an older Cole, newly freed after 25 years in prison. He also provided much of the narration in a smooth, clear voice; played the guitar accompaniment; and performed the role of Edwards, a supportive editor of a Kansas City newspaper. Dell could narrate the movements of sand in the desert and I’d be enthralled, his voice was so perfectly suited to the task. But given the eventful life the James brothers and Cole led, there was no stretch for interesting material. Doug Hastings’ lighting design was perfect, adding depth to the white space and illuminating the performers in effective ways. Hanrahan’s direction made use of the space, bringing the audience into a train robbery, and using the stage in such a way that there was never any question about what to watch, nor about what was going on. The performance runs a scant 90 minutes with no intermission, but the theater was on the chilly side, so definitely bring a sweater. The Ballad of Jesse James is entertaining as well as educational, and—although the truth may never be known—it felt like the true story, or as close as one could possibly get. Don’t miss this chance to come closer to the life of Jesse James, a man who lived as an outlaw for 20 years, and whose history just may have a thing or two to teach us about passion, terrorism, and the thirst for revenge.